That looks so attractive! And healthy! "A Pug" by Thomas Gainsborough, circa 1780. 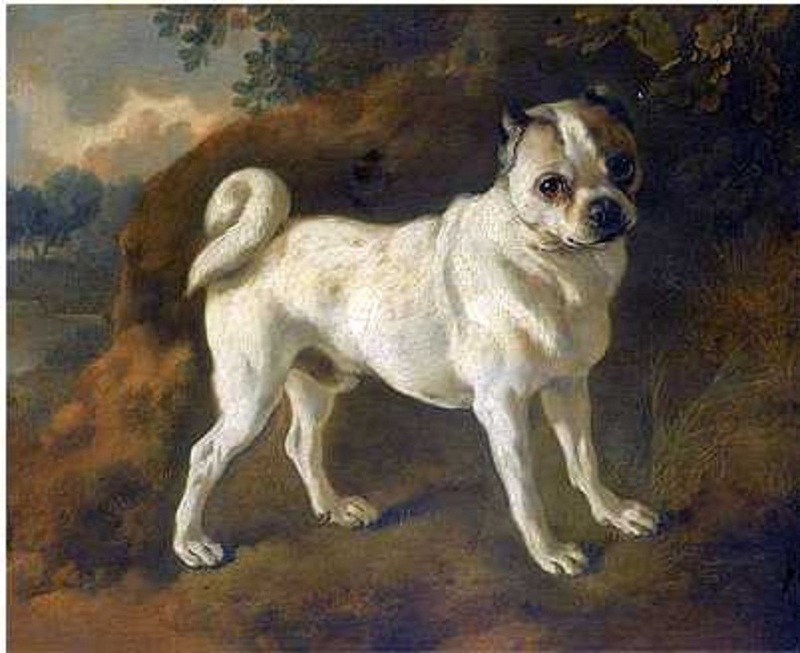 The above portrait of an eighteenth century English pug by Thomas Gainsborough suggests something that has popped up in some of the more recent genetic literature. Pugs, as we know them today, are not primarily Chinese dogs. Pugs group near the Jack Russells and some border terriers (that weird dark green line). They don’t group with the Shar-Pei, the only other Chinese breed in this study. This strongly suggests that pugs, although they may have derived from Chinese happa dogs that were brought over in the fifteenth century by the Portuguese, actually were developed in their current form in Europe. 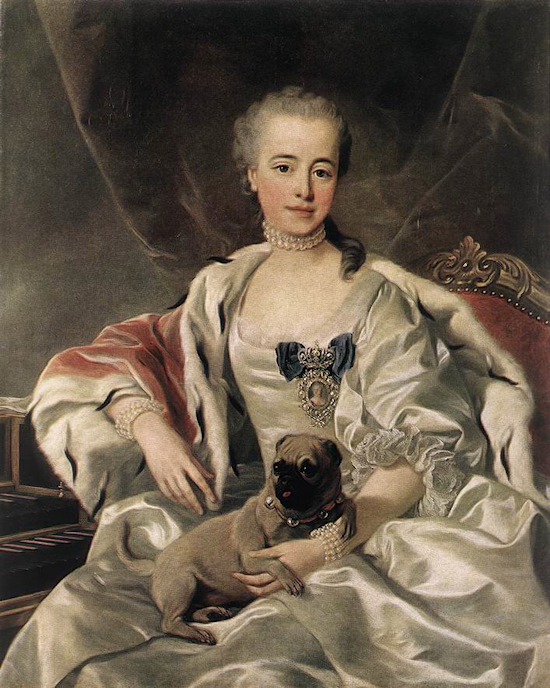 Pugs were first massively popular in the Dutch Republic. It is not clear if the Dutch imported them from China, but they certainly were trading in the region by the seventeenth century. Because travel in those days was quite arduous, it is very unlikely that the Dutch or anyone else brought over a lot of brachycephalic toy dogs from China. They may have brought over some, which were then bred to indigenous European toys. Then the Stadtholder of the Dutch Republic became King William III of England and then William II of Scotland. And the British people became pug crazed. In those days, William III– who is usually called “William of Orange”– overthrew the monarchy of James II, the last Roman Catholic king of England. James was a Stewart and a believer in the “divine right of kings,” which didn’t exactly endear himself to a largely protestant country that had been a republic just a few decades before. The same republic had been created upon the execution of his grandfather, Charles I. So they really didn’t much like his kind around there. For many years, pugs were called Dutch mastiffs or Dutch pugs, and everyone wanted one. These dogs were likely crossed with terriers and other small dogs that were fairly common in Britain at the time. So pugs in the British Isles were many generations removed from China, and as pugs spread from the Netherlands across Europe, similar things were happening. The Belgians bred their toy griffons to pugs. The Germans bred their small pinschers to them. It is not clear to me where modern pugs were founded from. I wouldn’t be surprised if they weren’t almost entirely founded from English stock, which then gradually replaced all the other pugs in the rest of Europe. The Kennel Club of the United Kingdom is the world’s oldest, so it may have simply been that they were the first to standardize the pug. And everyone else had to comply. The FCI considers Great Britain to be its patron country. This should tell us a lot about what pugs actually are. They might have been derived from a few Chinese dogs that came into Europe 400 or 500 years ago, but their current form was developed in Europe. And they are now predominantly of European blood. That means that Westerners decided what the pug should look like. Westerners decided that it would have the extremely shortened muzzle and the potential spinal defects that come from the double curled tail. And Westerners can fix the problems that pugs have. Appeals to supposedly ancient Eastern traditions are historically inaccurate. Pugs are European dogs now. 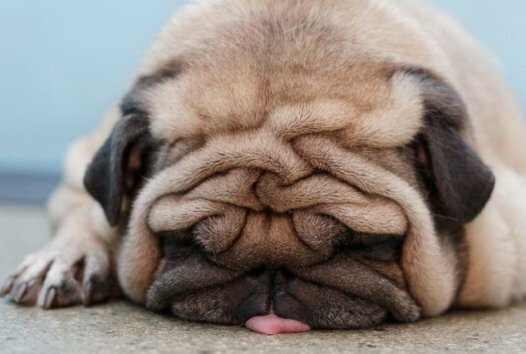 I would guess that the Pug suffered from the craze for flat faced dogs that swept the UK after the first Pekingese were introduced and caused a sensation. Pekes weren’t in the UK until the end of the nineteenth century. Pugs have been in the UK since at least the end of the seventeenth. And I suggest that it was when the Pekes appeared, that the Pugs and the to Spaniels began to be selectively bred for shorter and shorter muzzles, due to a fad for flat faces. Before that, they had longer muzzles. I know this happened to the Toy Spaniels, and am assuming the Pugs may have gone the same way. Something caused them to be selectively bred for flatter faces, after all. Toy spaniels and Japanese chins had short faces by the 1890’s, Pekingese where relatively long muzzled in comparision. I think the top one might be melting. I like to believe that all today’s little dogs with cruelly bred brachycephalic faces must owe their tortured existence to that raid by the British Army on the Imperial Palace at Pekin from whence Queen Victoria obtained her pet dog appropriately named ‘Lootie’. Sad but likely to be true? PS: Although I also believe that the Shih Tzu came off that slow boat from China with its face already flattened, albeit the best of today’s Shih Tzus have at least been bred with, arguably, a fairly comfortable length of muzzle – unlike the Peke itself poor thing. How could a Peke possibly pass any honest test for healthy construction? The original Pekes were not as flat-faced as the modern type either. The muzzle-less version of these dogs were invented in the West. Thanks for reminding us how the pug looked in the eighteenth century. Wouldn’t it be a good thing if we could get back to that more healthy design of head? Hola, muy bonito, pero no hemos de usar síndrome degenerativo a favor de humanos y en contra de perros, ejemplo “Burgos pointer” o Perdiguero de Burgos, en el cual se ensalzaron los defectos geneticos como una virtud ¡Gran error! 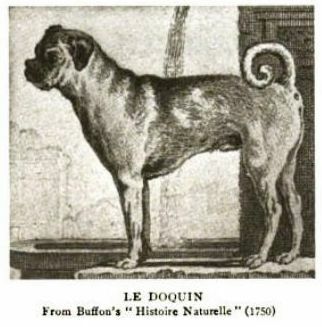 The type of the pug with a modern, flat-face actually existed already in 1700s. But that it became the only model for the breed, is sick. You could make that claim if it were in profile. However, that’s a much smaller pug than we have today. Is it too hard to think that those two types lived side by side quite a time – till the flat-face took over ? From the straight front (especially in grainy black and white photos) it’s true the dogs look very much the same. It’s from the side that the change is the most apparent. That second one clearly has a short muzzle. The first one is impossible to tell from the small picture. I think you’re seeing what you want to see. But don’t you then see, that those Russian and Portuguese princesses did had the “real thing” ? I see no use to go and measure their noses with a measure, but those dogs are a lot different than those mongrel-pugs(?) in the British pictures of the same period of time. The best “chin-pugs” brouhgt straight from the Far-East were small and flat-faced – and so expensive that only the very powerful people could know about or obtain them. while I quite agree that the odds were that a lot of available dogs were used in lieu of importing dogs from China, I suspect some father/daughter, grandfather/granddaughter breedings occured to “fix” type. And the usual transmorgification occured for conformation. 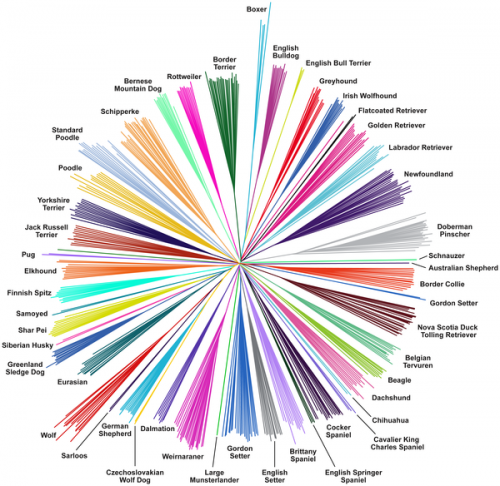 However, the breed relation chart above differs from some of the other “relation charts” that have been provided. I have a bit of a problem believing that a Belgian Tervuren is more closely related to a Beagle than to the spitz dogs or to the Irish wolfhound (who has been shown to clade with it before). There’s a shortage of several longstanding Euro breeds in the chart that might prove to be interesting to see if the Pug is related to them. Whichever angle they are looked at , Pai, you only have to listen to most of them – and watch them run out of steam – to appreciate they are dogs in distress. Basically the breed needs modification for obvious humanitarian reasons. Who knows, maybe the day is not so far away when this will begin to happen? Or is that wishful thinking? Looking at the latest Breed Record Supplement, I see that the popularity of Pugs has increased – 497 litters registered with the KC since July, putting them ahead of Cavaliers (another unhealthy breed) as the most popular, and presumably marketable, toydogs in the UK. I began an interest in canine brachycephaly when my wife announced that our gang was about to be joined by a shih tzu. You see we take daily walks over the chiltern hills and I was aware that our friend’s shih tzu had a breathing problem when accompanying us. However, we were lucky or wise in our choice as our shih tzu appears to have no such problems. Zuki, I might add, is the one charging out in front all the time and her breathing is silent and easy. Comparing the two dogs it is easy to see that our friend’s has the flatter face, so this is an object lesson and demonstrates that maybe the shih tzu is a borderline case. Can anyone comment on that? It does indicate to me that its must be possible to rescue a breed which has become generally too flat faced. I recall that many many years ago when the children were interested in our getting a pug we were shown a whole lineup of unfortunate gasping animals by the breeder and so we quickly changed our minds. Maybe it’s other aspects of the conformation, not simply the flat muzzle? Pugs have that thick neck and the extra folds of skin. This article features a former show shih tzu – without the hair, you can see that the dog isn’t as “thick” as the pug. I used to work as a vet tech, and pugs are nearly impossible to restrain – if you hold them securely, they can’t breathe. Don’t hold them securely, and they can wiggle out and bite (and if you try to put a muzzle on one, it’s difficult to do without injuring those pop-eyes). The best way to get a healthy pug is to get a puggle. They’re both puggle x puggle, not pug x beagle. You seem to get more color variety that way – the spotted one had siblings that were black/tan, reddish fawn, solid black, and black/white. While relatively short-faced, they’re capable of running, breathing, and doing all those other normal dog things. They do snore and fart a lot, though. It does seem injecting a little beagle in a pug bloodline might bring it back to the old-style pug, a much more natural looking dog. Thanks for both items, Jana, that must be one tough little shih tzu and actually she doesn’t look at all bad does she, despite all she must have been through. Incidentally my wife and I are familiar with her home area as I have cousins in the SanFrancisco Bay area whom we visit. Love the F2 puggles, though I guess their snoring indicates this particular crossbreeding experiment did not entirely solve the airways problem? I meet lots of small crossbreds these days as where we walk is not far from the place where they train hearing dogs for the deaf. It seems this organisation is very strict in their final assessments and so a lot of local people have the great good fortune to get a “fallen angel” as they describe them – delightful healthy well socalised little dogs – and without even having to be deaf to qualify for one! But I’m told there is a very long waiting list. Regarding the comment by retrieverman that crossing puggle to puggle creates more variety, well yes that is the usual F2 effect from mating two F1s together. Careful selection is then required among the highly variable F2 babies to weed out those that, by unfortunate chance, inherit disease or badly constructed features contributed by both parental breeds. Luck is also needed since not all abberant features will be immediately obvious among the F2 generation and may manifest later. The other side of coin is that some of the F2 babies will be entirely free from the diseases and bad construction of the original parent breeds of course. Proably the safest option is to always breed for F1s or otherwise introduce a third breed to the equation. The problem is so many breeders are so anti-crossbreeding that they would rather see a breed suffer than to make the breed ultimately better! Breeding is about making a breed better each generation and to improve on looks but the breeders only breed to make maximum profit ! You maybe being too pessimistic there, Gavin. Here in the uk for example one meets increasing numbers of people with mixed breeds and they are now seen as a positive way forward – for all the obvious reasons – with increasing numbers of people intelligently aware of the issues.